UPDATE: The House rejected Paul Ryan's amnesty bill by a 193-231 vote. The Ryan amnesty bill has been crafted by leadership and negotiated among Republicans in Congress over the past several weeks. It would potentially provide amnesty and a path to citizenship for well over two million direct beneficiaries over 15 years. They would include not only the 700,000 current recipients of President Obama's controversial Deferred Action for Childhood Arrivals (DACA) program, but also an additional 1.2 million illegal aliens who allegedly qualify for DACA but did not apply, plus as many as 300,000 adults who originally arrived with their parents on temporary guest worker visas, according to a new Center for Immigration Studies analysis. If the bill were enacted it would be the largest amnesty in more than 30 years, despite President Trump's campaign promise of "no amnesty" and after multiple GOP congressional leaders expressed opposition to amnesty for any illegal aliens. Most legal immigrants come via family-based chain migration. 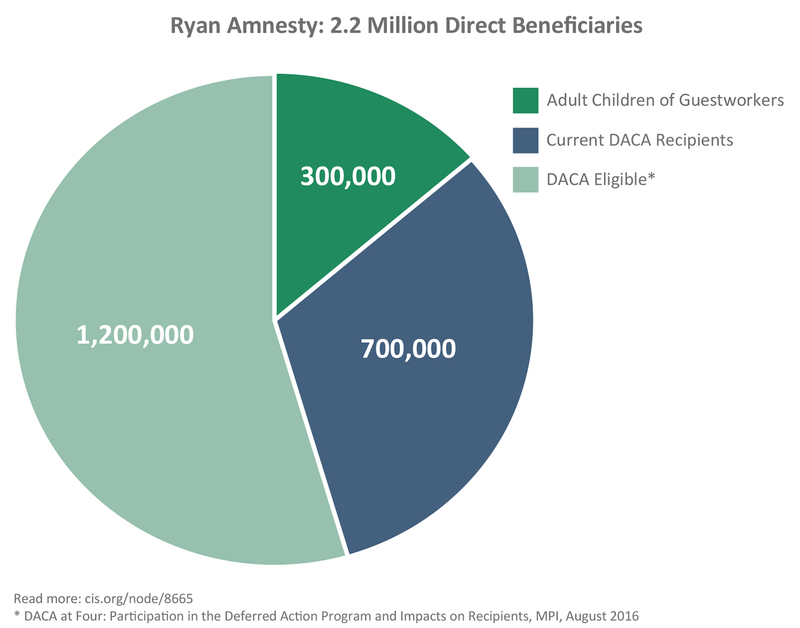 Unlike the Goodlatte bill, which came close to passing last week, with 193 votes, the Ryan bill would preserve the largest chain migration categories (such as the parents of naturalized citizens, including those of "Dream" amnesty beneficiaries) while transferring numbers from several smaller chain migration categories to other uses, thereby maintaining at least the same total number of green cards for the foreseeable future. Considering the difficulty Republicans have had in consolidating support for a huge bill addressing a variety of issues — from amnesty to asylum to criminal aliens — and a deficit of trust that might otherwise permit a quick vote, GOP leaders might instead consider breaking up the bill into more digestible pieces that are more conducive to consensus. Rather than trying to push a "Grand Bargain" that offers big deliverables to key interest groups, perhaps now is the time to tackle the individual issues on which there is agreement among Republicans and also a strong public consensus and desire for action. This might include stemming the flow of illegal arrivals from Central America and finding a way to enforce the law while avoiding separating parents and children. Narrowly focused bills dealing with these questions would provide each representative the opportunity to associate himself with real problem-solving and consensus-building instead of rejection and discord. After the 2013 Gang of Eight amnesty bill died on its way to the House, the GOP resolved to shift from massive immigration bills with huge amnesty provisions to smaller, so-called piecemeal bills. Today's vote will reveal whether the GOP can walk that talk.